When it came to my turn for a movie in the #blogfilmfood series, I had issues. Mostly our movies had been about or easily related to foods. The top two choices that came to MY mind? Mean Girls and Jaws. While a hump-day snack or homemade Kalteen bars would be great ideas, I wrote the girls and asked if they would think I was totally insane for wanting to do Jaws. It’s not the kind of movie you want to eat while watching, if you know what I mean. This group of ladies gets me, even if Jaws is a little bit outside the box for food posts. Or is it? SEAFOOD, people! Keep reading for some thoughts on why I love Jaws interspersed with photos of easy fish tacos. Recipe and a giveaway for the movie at the bottom! He alone stands fixed on the shore. Shouting, but along the shoreline, aware even when his toes are too near the water’s edge. The ocean is roiling with bodies, pushing and clambering to the shore. Parents rush from their towels into the water, grabbing their children, ANY children, and pulling them from the water. A few have fallen and must be dragged. Screams ring out and a torn yellow life raft floats where the water has clouded red with blood. And still Chief Brody stands, unable to enter the surf even for the sake of his own son. A man paralyzed by fear of water at the start of the movie, he concludes it by swimming through open water on a makeshift raft as the score from John Williams brings him home. When I grew tired of playing my Garfield and Smurfs records on my brown and orange plastic Fisher Price record player, I raided my parents’ collection. Saturday Night Fever, Sergeant Peppers Lonely Hearts Club Band, and the score from Jaws. Something about the title song that resonated with me, a six-year-old girl who had yet to see the movie. The rise and fall of the orchestra drew me in, taking me out to sea on a one-barrel chase, a few years before I ever saw the great white on the screen. It is an hour into the movie before you see the shark. A full hour of the best kind of suspense, where your mind fills in the blanks with something that may be far worse than reality. Underneath the gray-black water, something lurks. Something hungry and large enough to pull half a dock out to sea after swallowing a Christmas roast baited on a metal hook. A creature that leaves only half a girl’s body to wash up to shore for the crabs. When you finally do see the shark it is almost in slow motion, and not disappointing the way many horror movie horrors are, despite this film being almost 40 years old. Most movies do not hold their own for so long, especially with the advent of CG and all our movie magic. Then again, this is a Steven Spielberg film, his second big-screen directorial turn. No one knew his name then, but they still went in droves to see this movie, the pioneer summer blockbuster. My parents tell me the whole theater kept their feet up in the seats during the movie, as though they feared what might lurk even in the darkness of the theater floor. And at the beach that summer of 1975, no one ventured in the ocean past their ankles. Three scenes stay with me. The first is my earliest memory of seeing something gory. It is Quint, half his body inside the mouth of the great white. There is a sound when the shark bites down on his torso, a crunch underneath Quint’s screams, and I remember the catch in my throat, a feeling of nausea at the blood. I saw all four of the Jaws movies by the time I was nine, at an age when movie magic was still magic. The second is the conversation below deck as the boat rises and falls with the ocean’s swells. Whales sing and the three men join their song before lifting legs up on the table to compare scars. As a child, this scene bored me. As an adult, I feel that same catch in my throat as from Quint’s death at the telling of this true story: the sinking of the USS Indianapolis, a ship called to do the dark duty of delivering the first atomic bomb. Before this scene, my father tells me that this was a relatively untold story, this greatest loss of life in the US Navy at sea. The third takes place at the kitchen table, where a son echoes his father’s movements. Innocent to the stress that causes his daddy to lift his weary hands to his face, the boy makes it a game and for a moment, tensions ease. I wrote of how I see God’s love for his people in this scene, how we as children behave differently when we already have a seat at the table. The day I gave birth to Quin I arrived at the hospital for a routine appointment only to find myself in labor. They put me in a room while I waited several hours for my time slot in the OR. I called Rob, who asked if he should come be with me or if he should put together the crib he had saved o the two weeks we were supposed to have left before her scheduled birth. “Put together the crib,” I said. “There’s a Jaws marathon on.” From early labor all the way up to getting wheeled to surgery, I watched Jaws 2 through Jaws: The Revenge. None hold the power of Jaws, but I feel a kinship to them because they are related to the original. I joked on Twitter that we might name our baby after the movie. Abiggerboat, perhaps. Or chum. We hadn’t decided on a name if we had a girl and it took us two days almost to agree on Quinlyn. I did not realize for almost a week that without meaning to, we did name our baby from the movie, sort of. Her namesake the rough-edged Quint, an unforgettable character. Three weeks ago I saw Jaws on the big screen with my father, the one who instilled in me the love of this movie. A timely, special screening in which I took this photograph. There is something about seeing a film on a full screen in a darkened theater, the sound of the score that I heard on a plastic record player rich and full in the theater speakers. People gasped in the theater when a head floats through a boat’s hull, though I doubt the scene was unfamiliar. There was a sort of anticipation in the air before the famed line, “We’re going to need a bigger boat.” A tension breathed out in smiling relief. Perhaps more than any other movie, Jaws weaves through my life, its story entwining oddly with my own. It is more than a movie about a shark. It is more than a horror movie. The sound of Mrs. Kintner slapping Chief Brody on the silent, crowded dock carries with it a greater weight. This film is about a shark, yes, but it is also The Old Man and the Sea. It is about human need, human greed, human fear. It is about nature, red in tooth and claw. Like the shark, it is so much bigger than you might think from the surface. And now: Great White (Corn) Fish Tacos. I had never had fish tacos until I moved to Texas. I think I would have run from the sound of fish tacos. (I am a recovering picky eater.) But the combination of spicy, blackened fish with crunchy cabbage, topped with lime juice, cilantro, and a creamy sauce in a falling-apart corn tortilla is amazing. AH-mazing. My favorite fish tacos here in town are at Chachos. (Though they were a little skimpy on the sauce last time I had them.) 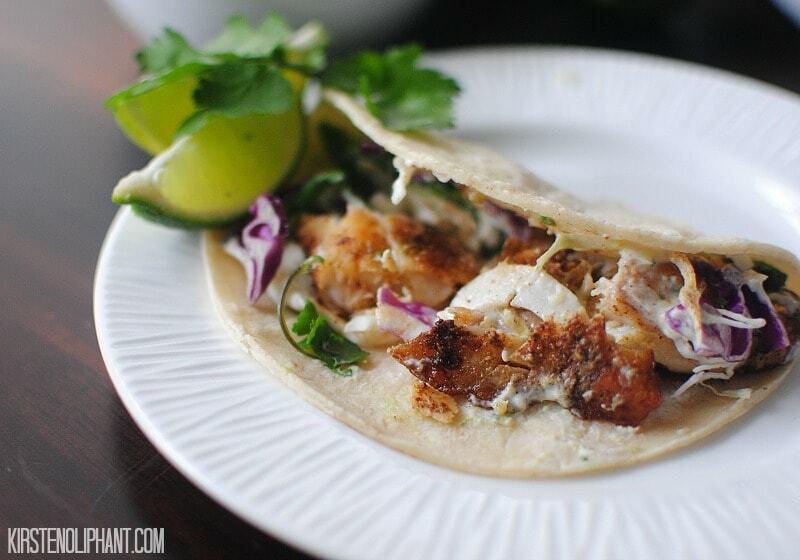 This easy fish tacos recipe is inspired by the ones at Chachos and uses my Hatch Chile Dip as a sauce. Quick notes: if you’re thinking of skipping the cabbage, DON’T. 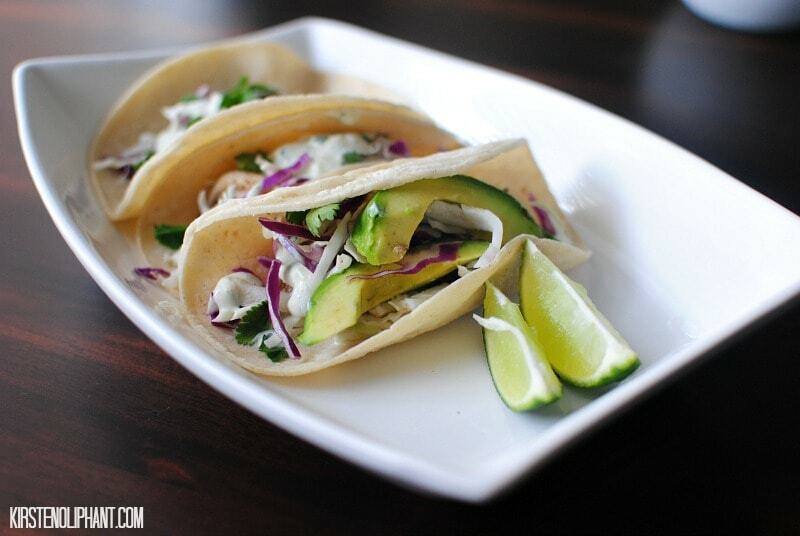 I know cabbage sounds weird on a taco, but it adds a freshness and a textural element that pulls everything together. I like squeezing some lime juice on the chopped cabbage and letting it sit for a little bit in that acid. Delicious.I also make my own blackening seasoning, but there is a great recipe from A Southern Fairytale for taco seasoning that would work well if you need more exact measurements. Prepare all the dressings and tacos toppings before you cook the fish. Pat the fish dry and then press the seasoning mixture onto one side. Heat the olive oil in a nonstick pan on medium high. 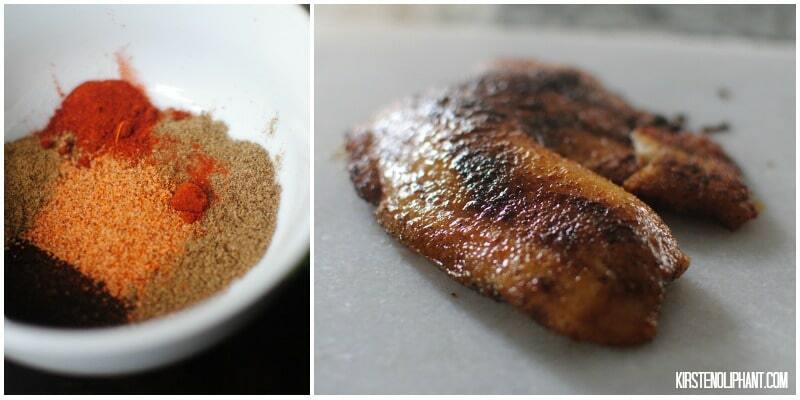 Place the fish spice side down in the pan. Heat for 3-4 minutes, pressing spices in the top side before flipping. Cook for another 3-4 minutes. You want your fish to be firm and white when you cut through it. Remove from heat and let rest for 1-2 minutes before tearing into pieces with a fork. Heat the tortillas in a damp paper towel for 20-30 seconds in the microwave. 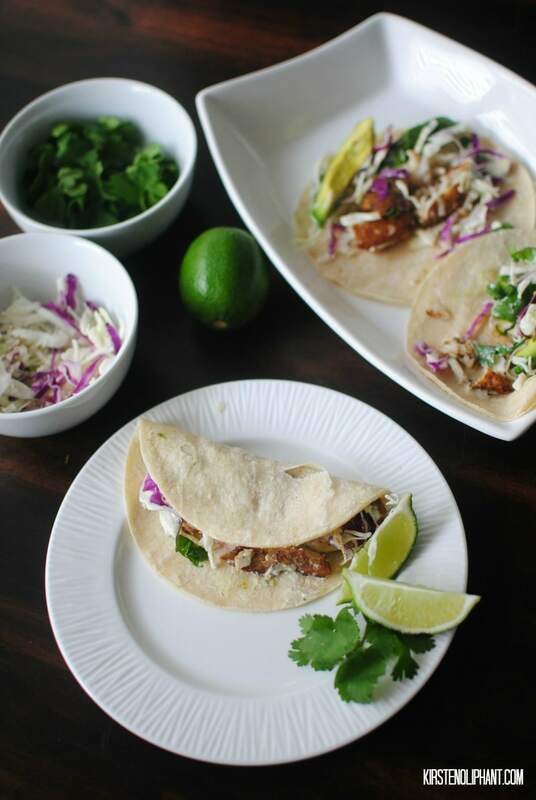 Place fish on the bottom of the tortilla and top with cabbage, cilantro, and avocado. Drizzle with the chile sauce and eat while warm. Now who wants to eat fish tacos while watching Jaws? You can win the movie right here! 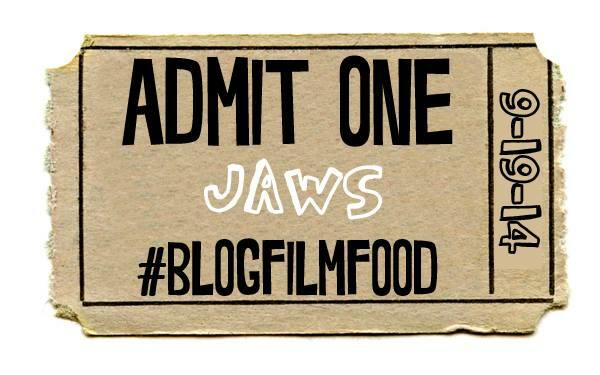 AND you can go check out some other great Jaws-inspired recipes from my fellow #blogfilmfood friends! That was a great movie, but to this day, I get nervous in the water. I don’t like to look underneath. And I have my own shark story as well, from the Jersey shore. As I watched my husband, 3 kids and a friend play in the water on a vacation, I saw a fin surface not too far from where they and others were. It was around dusk. Others saw it too. One man said “oh it’s nice to see a dolphin.” At this point, I was waving frantically at them to try to get them in and I turned to the man and said “do you know if it’s a dolphin?” He said no, and by then there was someone whistling to get people out of the water and others waving at their families to get them in. Nothing happened, but there ended up being shark sightings all over the news at the shore. Whether it was or wasn’t, I’ll never know, but who wants to take the chance?!! Anyway, that was off on a tangent! 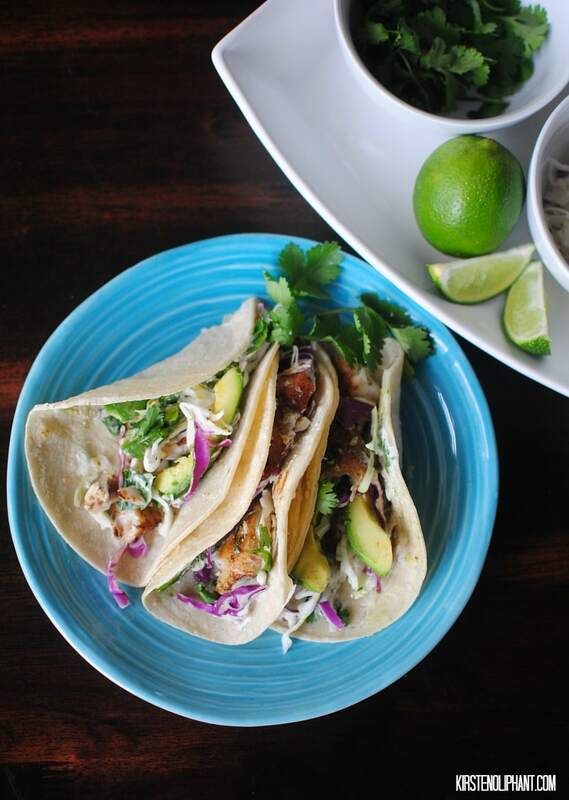 Your fish tacos look fabulous…I am pinning and sharing…can’t wait to try them because fish tacos are one of my favorite foods EVER!! 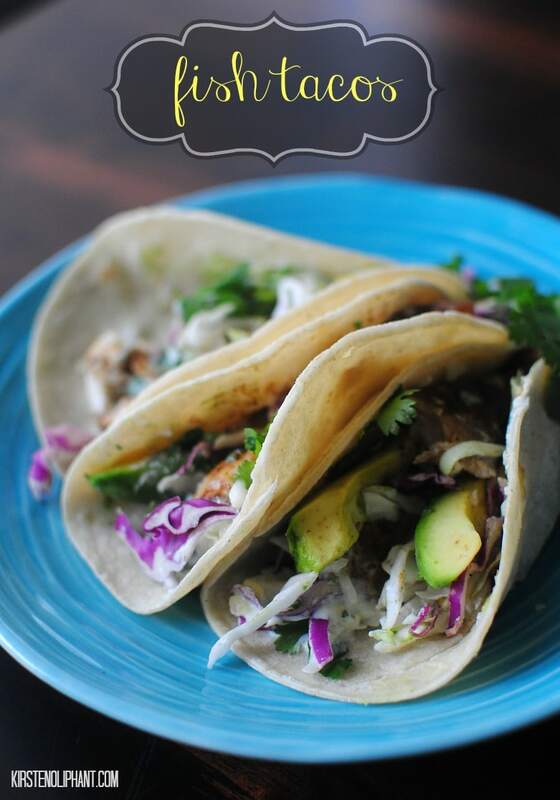 I don’t think traditional Mexican tacos include any fish, it’s usually meat, but the idea and recipe are super great!